We are going to see 7 centerpieces for the decoration of original weddings because weddings are one of the best inspirations at this time of year. Do not miss these ideas! We are already at that time of year when weddings are happening around us and this is a time of sunshine and good weather is the best time for outdoor celebrations. 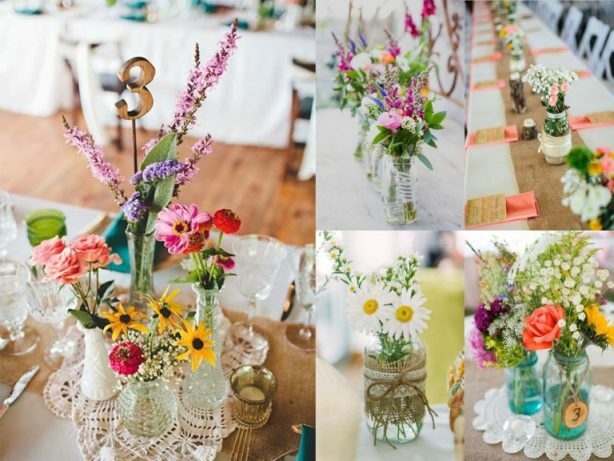 A must in any wedding are the centerpieces of flowers that give color and life to the banquet. But every day more table centers seek to be original and different with a romantic or bohemian touch. So we are going to see some ideas in the decoration of original weddings today so you can create your own centerpieces for weddings or for any celebration that you have in mind. Because weddings are the one of best inspirations at this time of year. Do not miss out on these ideas that are sure to inspire you! Recycling at weddings is fashionable. 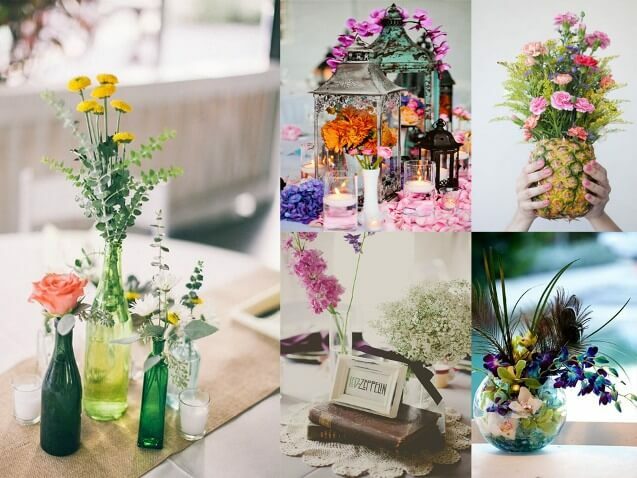 Every day more is looking to create simple sets with a bucolic and very natural air, for example using wild flowers. That’s why glass jars are perfect to create the right climate. Combine them in different sizes and shapes. You just have to put some small ornaments like strings, raffia, ribbons… and they will be the best support for your flowers. 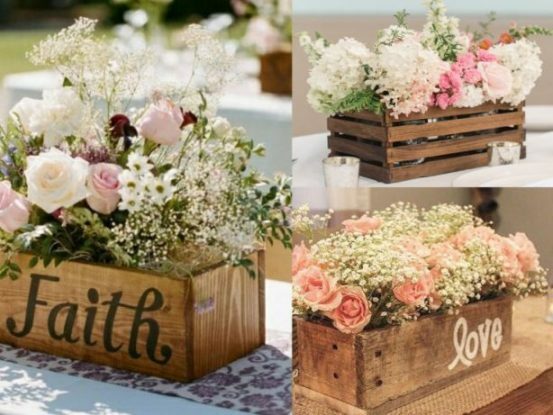 Another idea that we have seen much in the decoration of original weddings is to use like base a cut of a wooden trunk, which will end up giving a very natural look to your centerpiece. But you can also use as a base a rug or a piece of raffia to give that point so boho and much more. Get different glass or even colored pots and combine different flowers for a nice effect. We love that natural air! That can perfectly serve for any special lunch or dinner you have this summer. Copy it and your guests will be delighted! Another good option is to use glass bottles, if you can be combining different sizes even better to create a more beautiful effect. The bottles can be recycled in many ways, one of which is to give them a coat of gold or bronze paint. Recycling is fashionable even at weddings and big occasions. And we continue with the decoration of original and natural weddings and with a very tropical touch that is undoubtedly one of the trends of the season. 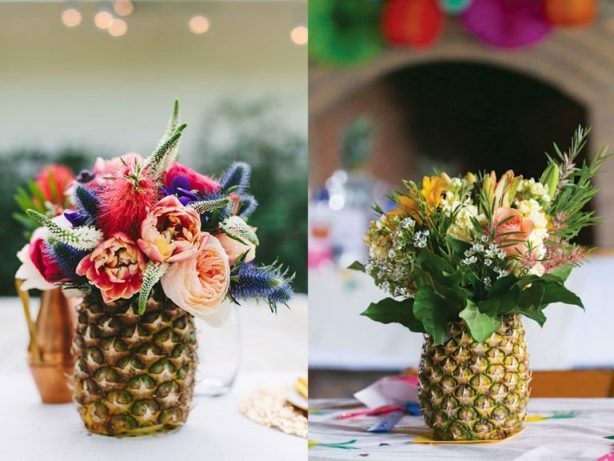 Pineapples can be your best allies when it comes to creating a very original and colorful centerpiece. Nothing simpler, the important thing will be to create a charming floral arrangement that we will put in a pineapple as a vase, it’s that simple! But also that nice. Books as well as travel companions and a source of inspiration can also be part of your centerpiece. It has the multitude of uses that we can give them in decoration and for weddings they were not going to be less. You can use them as support for floral arrangements to give a vintage touch to the event or you can give all the prominence turning them into a central element of the arrangement. It’s up to you! But without doubt they will give a very original and different touch to the centerpiece. What do you think of the idea? 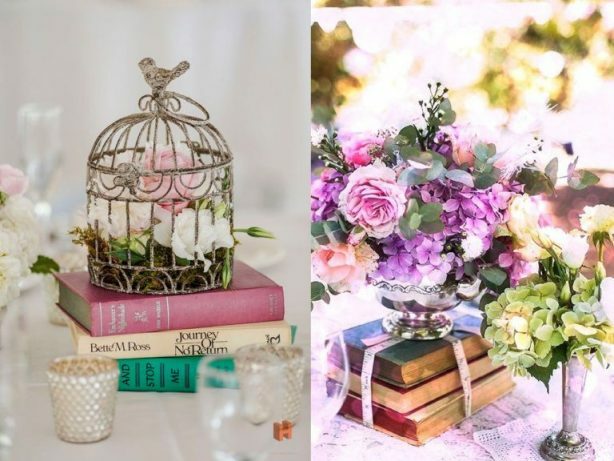 You can combine them with all kinds of elements such as floral arrangements, small glass jars, teapots, metal boxes, cages … You just need to combine them with a little grace to create a harmonious and full of charm. You can also join the books with a bow or with raffia. We continue with the decoration of original weddings with an essential element if you want to give a natural air to your centerpiece, the wood. 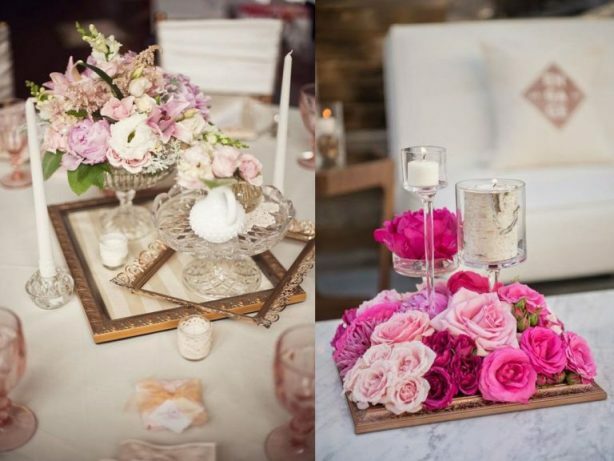 And the wooden boxes can be the perfect support that your floral arrangements look in their entire splendor. A simple presentation but full of charm and that can also be reusable, and then you can use them at home. Decorate them with some words related to the party and you will have some very personal centerpieces. Smaller and more square boxes can also be the basis for floral sets perfect for the tables of the guests, surely everyone loves them! A very bohemian air for a very special day. If you have some frames at home that you do not know what to do, you can also incorporate them into your centerpiece and use them to frame it and give it prominence. A very personal element in the decoration of original weddings, do not you think? I have loved the idea of using it as a base for a floral arrangement. Simple but very effective and nothing seen. Better if the frames are in gold or silver to give it a more special and festive character. What do you think about this idea? The lanterns are another classic that we can add to the decoration of original weddings and that we can take much advantage as part of our centerpiece. In case alone they already give off a special charm so when filling them with flowers it will be able to recreate a bucolic environment and as a story that will be beautiful. In addition they are an easy element to obtain and that later can be as a souvenir for our guests, surely they love the idea! 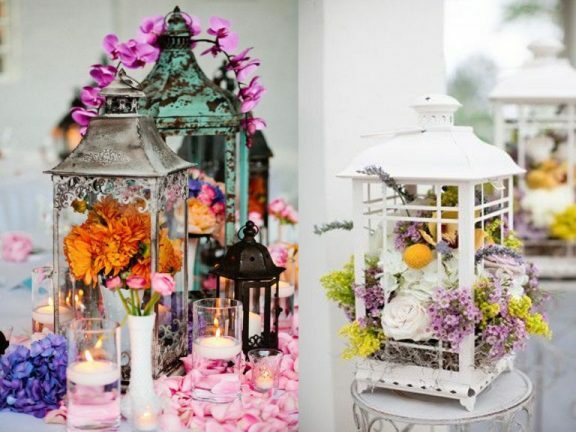 Depending on the size of the tables to decorate you can combine several lanterns of different sizes and colors or you can focus all your attention on just one that overflows with flowers and color for an effect that I personally love. It is an idea to also take advantage of for summer celebrations on the terrace or the patio, because it will give our table a very special touch. Do you want to try it? Finally, another element that we can have at home or recycle. 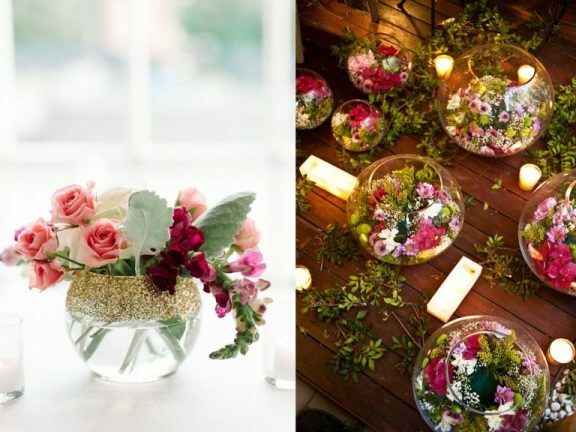 Glass bowls can also be a good solution for your centerpieces, since their shape is perfect to create very special centers. Whether filling them completely with flowers or combining with water and floating candles. An idea that we have been seeing for some time but that I personally still love. More if we give the fish tank a special touch as in the image with golden glitter, fantastic! And here are the 7 ideas for centerpieces for the original wedding decorations that I hope have inspired you to create your own centerpieces. Whether for a wedding or for any other type of party or celebration at home sometimes with the least thought elements we can create something very special and unique because it will take something from us.